Worthing Football Club chairman Pete Stone feels the club lost a year off the field last season owing to pitch problems at Woodside Road. All of Worthing’s first five home league games were played at Bognor last season because of issues with their 3G pitch and Stone admits the club are still recovering from that even now, given the cost of playing at Nyewood Lane and lost revenue. Worthing averaged more than 850 for the final six home games of last season and felt attendances would have been higher all season had they been able to play at Woodside Road throughout the campaign. Stone said: “Off the pitch we lost a year last year. On the pitch, we lost a couple of months and then we gained it with Adam (Hinshelwood). It’s swings and roundabouts. 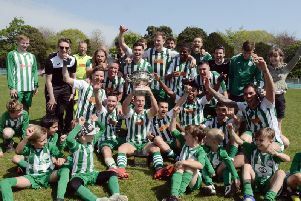 Stone added the club had not progressed much since their promotion into the Bostik League Premier Division two years ago. Since coming up from the South Division, Worthing have finished 14th then 16th and Stone said: “I think in the past 18 months we’ve probably stayed flat in terms of progression. We’ve got the Development Centre which is a huge investment and that got off to a fantastic start but then Meeno (Jon Meeney) went, the first team fell apart and went flat and the Development Centre also went flat and we lost a lot of good boys. “On the pitch, it went flat for a period of a year and a bit. “Off the pitch we put some good things in place like budgeting and getting some basic dynamics of running the club but, all in all, it stayed flat. It’s probably been the past three months where we’ve kicked on again. “It’s kicked on through things like PR, reputation and getting more people involved on a voluntary basis. “Now I can see a pathway to being a National League club as clear as day. “I can see the big things we need to do and the accumulation of the little things we need to do. Worthing managing director Calvin Buckland added: "Even with crowds, it took until the last five or six games for them to get back to where we felt they probably would have been at the start of the season if we'd been at home and had got off to a reasonable start. "It has a knock-on effect. "Gate entrance money is as low as we can do, the food and the beer and everything else is on the lower end of everything. "But you need the crowds and the volume to sustain that." Stone has already said he feels the club can sustain crowds of over 1,000 next season and said: "The final six games of last season, our average crowd was 850 which just shows you what a little bit of promotion can do. We only really had articles in the Herald and plugs on Facebook, that was all we did in terms of promotion and then word of mouth gets it out there. "There were a lot of new faces who came down and the message you get is 'this is fantastic, the atmosphere is great and the feel of the place with the kids and families is great'. "There's a local connection at Worthing where people see their mates and then people will come back again. "That is what we need. I generally think that when next season starts, we will be a 1,000-plus average."